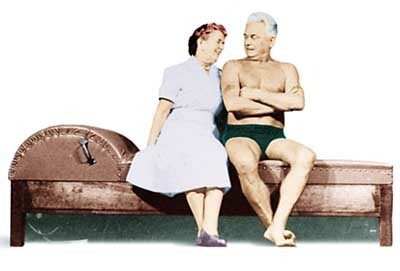 The Pilates method originated with one extraordinary man, Joseph Pilates. Born in Germany in 1880, he overcame childhood diseases including asthma and rickets to become a gymnast, skier, boxer, circus performer and self-defence instructor. Pilates moved to England and during WW1 he was interred as a German National. During this time he began teaching his fellow internees, beginning the development of what would later become his method of ‘Contrology’. Later during the war, whilst working in a hospital, he was working with patients who had difficulty walking and realised that by attaching springs to their beds, they could strengthen their muscles whilst bed bound. His innovative approach went on to be made into the ‘Cadillac’ one of his pieces of Pilates equipment that is still used today. Pilates moved to America in the 1920s and opened his first studio in 1926 with his wife Clara, who was integral to the teaching and development of the method. The studio contained much of the equipment that is still widely used in Pilates studios all over the world. Dancers and actors of the day came to the studio for rehabilitation or to improve dance technique. Pilates called his method ‘Contrology’ but this became known as ‘Pilates’ after he died in 1967 in his 80s. The method was continued by teachers who had been pupils of Pilates and was, in turn passed on by them, evolving and developing as it was spread around the world. Although many people teach and practice internationally, most remain true to the original exercises and principles of Joseph Pilates, a true visionary of the 20th Century.